1: "The Puzzle of the Gods"
Section 1: School arc (第（だい）一章（しょう） 学（がく）園（えん）編（へん） Daiisshō Gakuen hen) is the first arc in the Yu-Gi-Oh! manga. This arc tells the story of Yugi Mutou solving the Millennium Puzzle and making new friends. Unbeknownst to Yugi, his body occasionally becomes host to Dark Yugi, who deals justice through the use of Shadow Games to people who cross Yugi and his friends. In the Shueisha Jump Remix, Yu-Gi-Oh! Duel 26: "Russian Roulette" is considered to be part of this arc. However according to Yu-Gi-Oh! Character Guidebook: Millennium Book, it considered to be part of the Death-T arc. One finger BATTLE! Escaped prisoner Dark Yugi Fire~!!! Question of Truth Curator Kanekura Shadi Ammit Roosting in the "Soul Room"
Yugi Mutou is been bullied in school. Protected and comforted by his friend Anzu Mazaki, Yugi shows her his secret puzzle, that he has been unable to solve for eight years. Although offered protection by the hall monitor Ushio, Yugi is not happy with Ushio's methods. Jonouchi is now friends with Yugi. The two of them get excited when they see a ZTV van outside their school. While they hope that means there is a star present, the studio turns out to be doing a documentary about bullying. Yugi is forced to sell tickets for Sozoji's concert or suffer consequences. Not wanting to put his friends through Sozoji's horrible singing or have them pick a fight, Yugi insists that he's fine and won't tell them what he's been made do. Katsuya Jonouchi and Yugi Mutou notice Anzu Mazaki has been behaving strange lately. Investigation causes them to meet up with an escaped convict. The alleged psychic Kokurano has gained great popularity at Domino High School. However Yugi Mutou is skeptical of his powers and upset by Kokurano's interest in Anzu Mazaki. Goro Inogashira takes over Yugi's class' spot at the school festival, where they were making Carnival Games. Jonouchi gets Yugi to help Honda with his crush on Miho Nosaka. However this gets them into trouble with the teacher Ms. Chono. The Junky Scorpion owner sold Jonouchi a pair of Air Muscle sneakers, then hired a gang to mug Jonouchi and rob him of them. When Yugi found out, Dark Yugi appeared to start a Shadow Game with the store owner. Seto Kaiba finds Sugoroku Mutou has a "Blue-Eyes White Dragon". After Sugoroku refuses to trade for the card, Kaiba resorts to dishonest means to get it. Dark Yugi continues his Duel with Seto Kaiba to win back his grandfather's "Blue-Eyes White Dragon". After Jonouchi misses a day of school, Yugi, Anzu and Honda check it out and find Jonouchi is now hanging out with Hirutani's gang. Jonouchi turns on Hirutani's gang for punching Yugi earlier, but is unable to take them all on at once. Meanwhile, Yugi, Anzu and Honda desperately search for Jonouchi. Treasures from a recently discovered pharaoh's tomb are put on display in Domino City Museum. Yugi lends his Millennium Puzzle to the exhibition and Shadi tests the souls of the men he sees responsible for defiling the pharaoh's tomb. Shadi enters Dark Yugi's soul room to learn more about the Millennium Puzzle and take its power if he needs it. However Dark Yugi's true soul room is hidden inside a labyrinth. Shadi accepts a Shadow Game, set by Dark Yugi, where he must search for Dark Yugi's true soul room. Shadi prepares to kill Professor Yoshimori for defiling the territory of the Gods. After entering his soul room, Shadi finds Yoshimori is waiting for Yugi to visit, so he decides to postpone killing Yoshimori and use him to lure Dark Yugi into a Shadow Game. Shadi redecorates Anzu's soul room to draw out Dark Yugi, while he leaves the zombified Professor Yoshimori attack Yugi's friends. 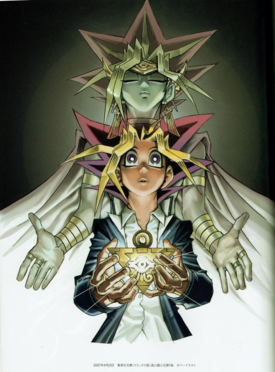 With Shadi holding Anzu in danger, Dark Yugi is forced to face Shadi in the first stage of his Shadow Game. Shadi subjects Dark Yugi to the second stage of their Shadow Game. Yugi must solve a puzzle, while grasped by an illusion of Ammit. For the final stage of their Shadow Game, Shadi has Yugi face an illusion of Jonouchi in a game. Dark Yugi finishes his Shadow Game with Shadi. Digital Pets have become popular at Domino High School. Kujirada, who believes himself to have the ultimate pet, ends up in conflict, with Yugi, his friends and their pets. Tomoya Hanasaki invites Yugi and his friends over to see his Zombire collection. After they leave Hanasaki takes his Zombire obsession too far. Hanasaki, dressed as Zombire faces the delinquents again, but this time his father cannot afford to pay to let him win. Seto Kaiba's younger brother, Mokuba faces Dark Yugi in a game of Capsule Monster Chess to get revenge for the Penalty Game, Dark Yugi inflicted on Seto. Yugi and Jonouchi go to the arcade to try beat someone's high scores, but end up in a spot of trouble after meeting Street Fighter, who does not take too well to losing. This page was last edited on 18 March 2019, at 16:08.